Castle Ashby’s winter league is all done-and-dusted and – given Sunday’s bone-chilling final round conditions – few will have been sorry to hear its final whistle. With mini-’ice flows’ drifting around, it was challenging to say the least, but venue proprietor Mick Hewlett was on fire, taking 10 Grendon carp and a bream for 83-10 – a stunning catch considering the next weights were Chris Camplin’s 14-4 and Steve Shakespeare’s 13-14! The normally prolific Brickyard was just as dour with John Bazely on 25-4, Paul Robinson 18-10 and Courtney Hewlett 13-14, while Scotland Pond saw Joe Roberts on 21-15 with John Robertson on 10-6 and Mick Wheeler 7-6. Team Boddilly were top on the day but still out of the series frame as Team Pizamenti emerged champions, with 32 points, with Paul Robinson’s trio on 33 and Courtney Hewlett’s crew 38. 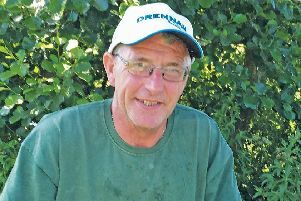 AS the league men gratefully left...Russell McAllistair moved into a swim vacated by a man who told him he hadn’t had a bite in the match – and landed three carp on double dead-maggot before the light went. WINNERS of last year’s AT winter league on ‘Ashby – Black Horse and Maver MK – fished the national final on Decoy and nearby Fenland drains, Saturday. ‘Horse finished 14th from 33 teams and ‘MK 25th, with the former’s Pete Archer notching fifth individual spot on 36.25 kilo – from a field of 330 – and MK’s Bryn Wignall 9th, 32.9 kilo. CARPER Mike Jarvis had a 21-8 mirror from Stanwick’s Mallard. BARSTON feeder-league third round: Maurice Williams 27lb, Mick Bull 8-4, Pete Caton 6-8. WHITE Hart Flore oldies, midweek, Spring Pool: Ron Collins 20-8, John Tee 18-8, Terry Perrin 15-11. COUNTY Vets, Canons: Paul Lafflin 8-9, Bob Spencer 8-7, Dave Cantrell 5-8. TOWCESTER/Nene, Ringstead Nene: Graham Prince 5-8, Graham Martin 3-8, Bob Eales 3-2. OLNEY, midweek Ouse open: Neil Shearn 3-6-8 (inc 3-2-8 perch), Nigel Porter 3-1 (one perch) Les Wallis 2-4. FLORE & Brockhall, silverfish teams-of-three, Barby Banks: Brian Johnson 3-5, Dave Cleaver 1-9, Steve Barratt 1-1-8. Nubold lead 50.5 points with Tony’s Trio 43.5, Dolphins 27. FIXTURES: Sunday’s Tove Valley Lakeside open cancelled; March 10, MKAA grand slam, 01234 713144, ALSO, rearranged Olney Ouse open 01234 240061.